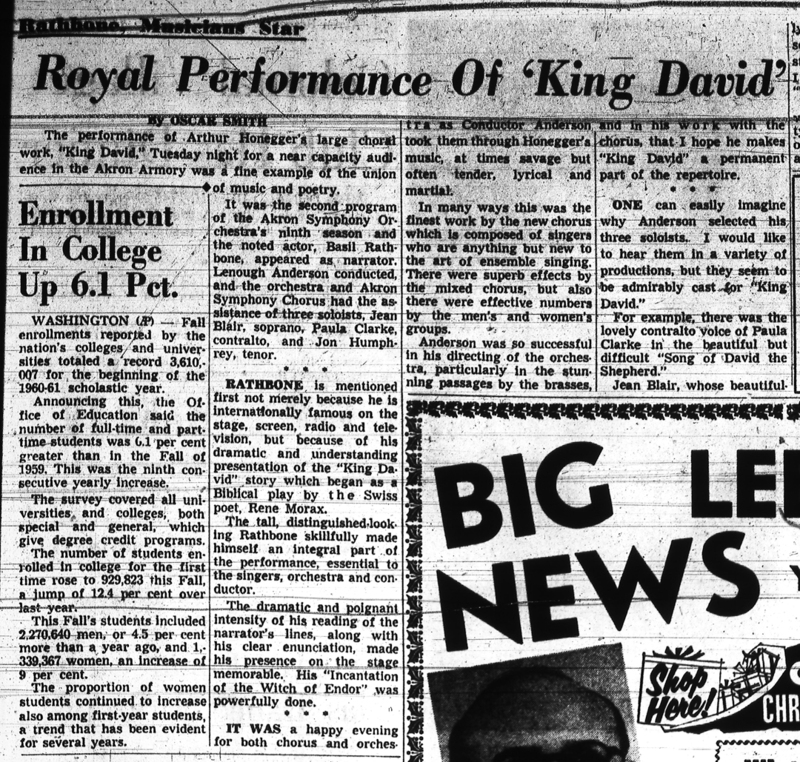 The front cover of the “King David” double-LP set. 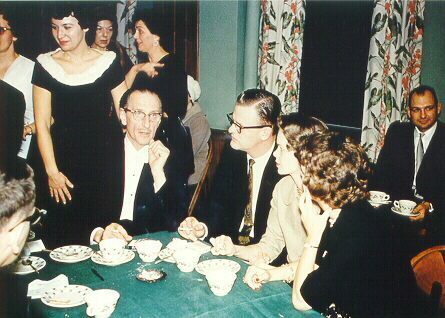 Basil Rathbone relaxes with fans following the performance of “King David” at the Akron Armory. Akron Beacon Journal, December 7, 1960. Akron Beacon Journal, December 6, 1960. The Akron Symphony Orchestra began in 1949 when the business manager of the Akron Beacon Journal made a $500 donation to help create a classical music organization. 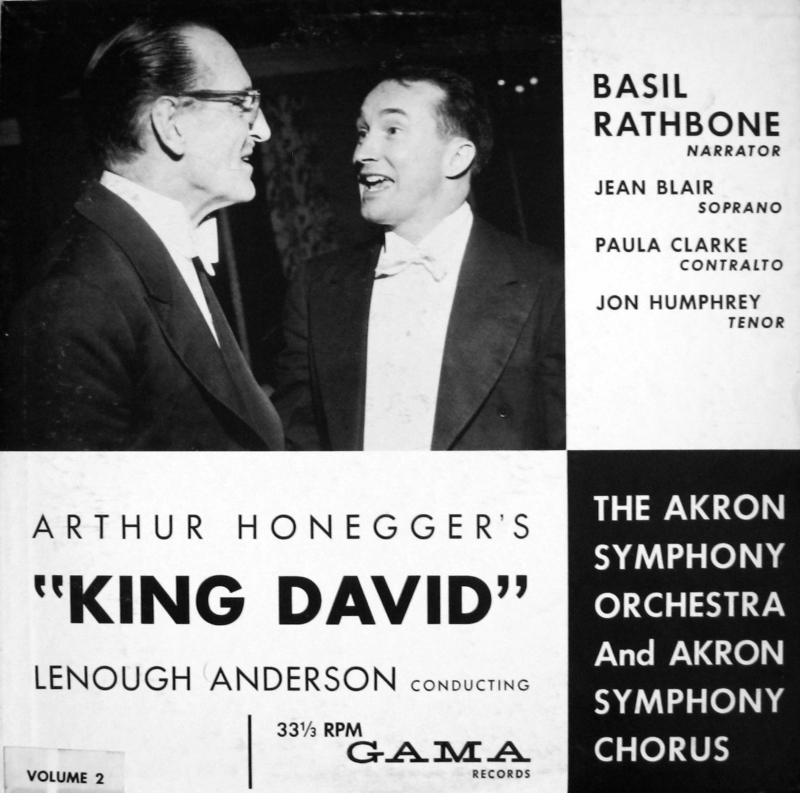 In the following decades the Orchestra has released only a handful or recordings, one of the earliest of which is this double-LP set of a December 1960 performance of King David based on the 1921 oratorio Le roi David by composer Arthur Honegger. So why record this specific performance? Stage and screen star Sir Basil Rathbone had agreed to narrate the show and serve as MC. Rathbone was well-known for his portrayal of Sherlock Holmes in a variety of feature films, radio shows, TV programs, and live stage appearances. His voice was distinguished and highly recognizable, so it’s no wonder the Orchestra wanted to preserve this evening on wax. 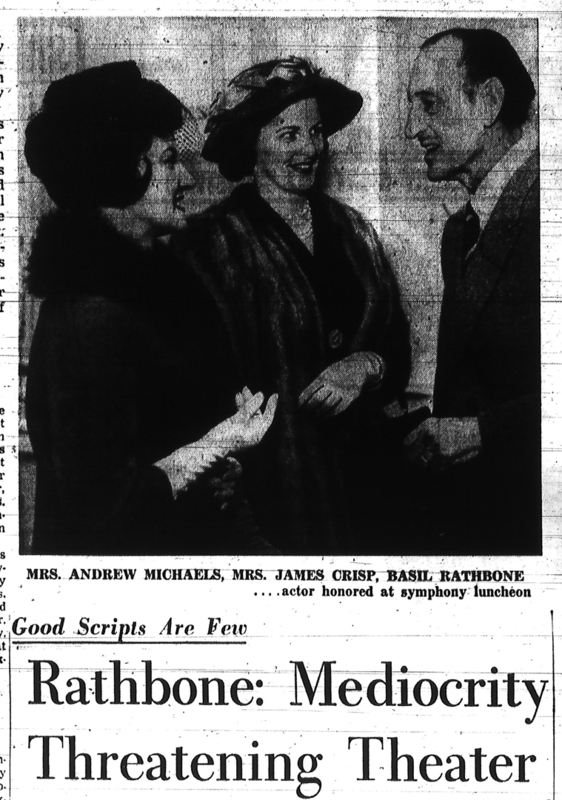 When Rathbone arrived in Akron on December 5th he was honored with a luncheon at the Akron City Club hosted by the Akron Symphony Women’s Committee. He posed for photos, signed autographs, and discussed his most famous roles and future Hollywood plans with the Beacon Journal. The next evening Akronites packed the Akron Armory for the recorded performance. Lenough Anderson conducted the Orchestra and the Akron Symphony Chorus was led by three soloists. While there are two separate LPs of the recording, both share the same cover design and a sticker was added to differentiate between the two volumes. In my fifteen years of picking through records at thrift stores I have only come across these albums once. I have digitized both records, but have only posted an MP3 of the first portion to this blog. If you have any other Akron-related recording you would like to share, please let me know!